A boy named Oda Shinsuke is very infatuated with billiards. Problems arise when a new student body president, Hayakawa Asako, suddenly decided to cut the funding for his billiards club. Unhappy with that, Shinsuke wants to convince Asako that his billiards club is worthy of the funding. He decided to challenge a two-time former national billiards champion. Will Chinmi be able to defend his club? It never ceases to amaze me how a person can find almost anything he/she is passionate about, covered through the eyes and the heart of fellow artist. Sometimes it gets really popular, and sometimes the art is getting dragged through the slums, never reaching the wider audience. Break Shot is in the latter category. Question that naturally pops up is - is it justifiable placed there? Do note that this review may not be 100% unbiased, due to me having underdog stories as a guilty pleasure, which are easily found in most of the sports manga and anime. Take on the story itself is rather simple. Our main character is infatuated with the billiards, and most of the chapters focus on showing his sharp mind leading his passionate heart through bunch of matches and championships. At the second half of manga, we are introduced to some mystery elements, which pace of revealing is slightly slower than preferable. Art style is sort of (what I deem) classical for the late 80s, and whole take on the plot and character development fits that mold as well. It doesn't mean it doesn't exist, but it is quite gradual, and it takes time to do so. Very nice amount of characters do feel quite unique, even though obvious focus is solely on main character, both skill and personality wise. Perhaps it is because it is billiard we are talking about that the characters feel... less brute, and more intelligent, which makes it as a plus in my book. Of course, like most of sport mangas (especially ones published by Shonen), Break Shot as well follows some tropes. Although, given how long ago it came out, I do wonder is it perhaps among trend/trope setters instead. One of the tropes that was avoided almost completely was development of love interest. It exist, in a way, but it isn't even part of the focus. Despite it all, Break Shot do offers quite an enjoyment to a reader. It is thrilling to observe how will the main character deal with perils on the pool table. Not just him, but how other characters deploy their tactics, how they think (mangaka did good job on developing enough unique tactics among individuals), how they deal with mistakes etc. I think Break Shot came too early for sake of todays readers, because it is extremely difficult to find whole manga translated to English. At one point, I had to switch to Indonesian translations, just so I could finish the story (God knows I didn't manage to understand it all, but one can connect the dots enough), so if you do consider taking this manga to read, be prepared for this issue. It will be worth it though. However, it has to be acknowledged - billiard is not enjoyable to everyone. 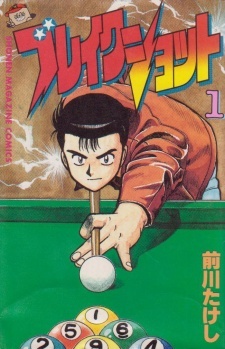 If you love billiard, you will most likely enjoy this manga. If you are sucker for sport stories, you may like this manga. if you appreciate when majority of characters actually do have brains, you could give this a go.